Also serving communities of New Middletown. There are 37 Assisted Living Facilities in the Poland area, with 5 in Poland and 32 nearby. The average cost of assisted living in Poland is $2,912 per month. This is lower than the national median of $3,346. To help you with your search, browse the 103 reviews below for assisted living facilities in Poland. On average, consumers rate assisted living in Poland 4.3 out of 5 stars. Better rated regions include Boardman with an average rating of 5.0 out of 5 stars. Caring.com has helped thousands of families find high-quality senior care. To speak with one of our Family Advisors about assisted living options and costs in Poland, call (855) 863-8283. Located a few miles southwest of Youngstown, Ohio, Poland is a small town with a population under 3,000, yet 17 percent of residents are over the age of 65. There are 37 assisted living communities in the Poland area, and five of the communities reside within the city limits to support seniors in need of help with daily tasks such as housekeeping and grooming. In Poland and the rest of Ohio, the Department of Health provides licenses and oversight to assisted living communities and refers to them as Residential Care Facilities (RCFs). Poland is a safe community compared to both the Ohio and national crime rate averages. The violent crime rate here is 93 percent lower than the national average, and property crime rates are 77 percent lower, so seniors will likely feel safe walking in town. The WRTA, a public bus service, runs Monday through Saturday with 21 fixed routes in Poland, providing seniors safe transportation around the area. For seniors, money stretches a little further due to Ohio state tax laws. The state doesn't tax Social Security retirement benefits, and it gives senior tax credits on pensions and retirement savings accounts, including IRAs and 401(k)s.
Poland does have cold winters with temperatures in the high teens to mid-thirties but doesn't see a lot of snow. However, moderate temperatures in the spring, summer and fall make it a great location for seniors who enjoy spending time outside. The cost of living in Poland is two percent lower than the rest of Ohio and 16 percent lower than the national average, making it an affordable option for seniors. Poland has few facilities from which to choose in the event of a medical emergency or illness, with the nearest major hospital located in Youngstown, Mercy Health — St. Elizabeth Youngstown Hospital. Assisted Living costs in Poland start around $2,912 per month on average, while the nationwide average cost of assisted living is $4,000 per month, according to the latest figures from Genworth’s Cost of Care Survey. It’s important to note that assisted living rates in Poland and the surrounding suburbs can vary widely based on factors such as location, the level of care needed, apartment size and the types of amenities offered at each community. 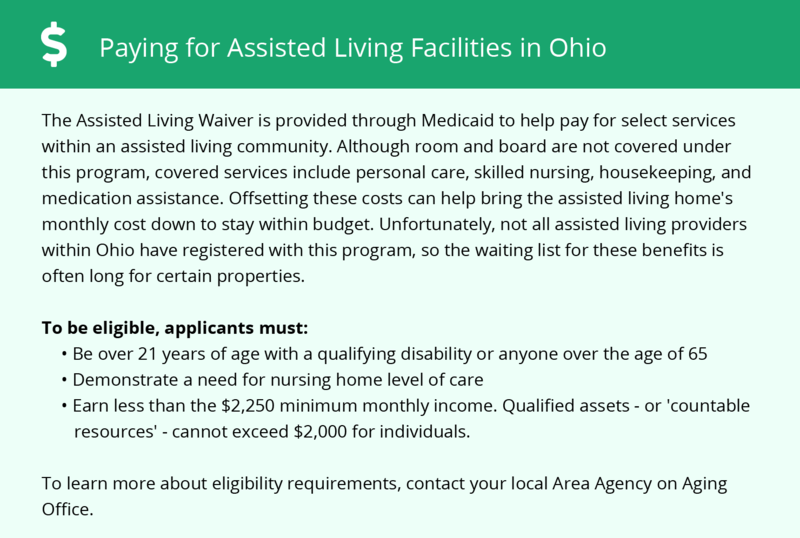 While Ohio offers expanded Medicaid to help seniors afford the costs of assisted living, there are very few additional options. 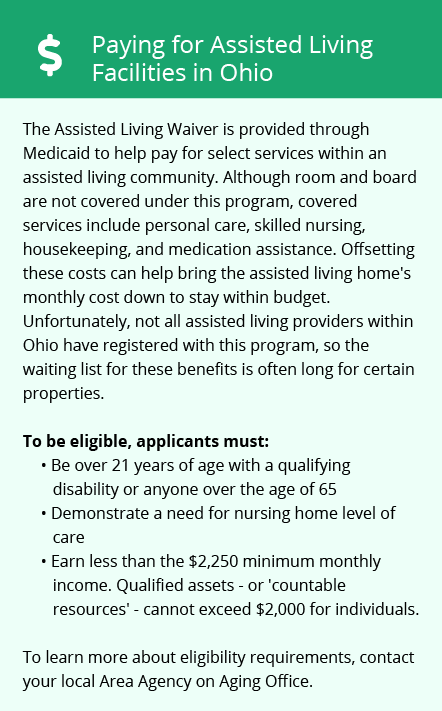 The Residential State Supplement (RSS) can offer some help on housing costs, and the Golden Buckeye program helps seniors save money on services. Poland and the surrounding area are home to numerous government agencies and non-profit organizations offering help for seniors searching for or currently residing in an assisted living community. These organizations can also provide assistance in a number of other eldercare services such as geriatric care management, elder law advice, estate planning, finding home care and health and wellness programs. To see a list of free assisted living resources in Poland, please visit our Assisted Living in Ohio page. Poland-area assisted living communities must adhere to the comprehensive set of state laws and regulations that all assisted living communities in Ohio are required to follow. Visit our Assisted Living in Ohio page for more information about these laws.